blogger clocks must be off. so i HAD to order right? i sucked down the whole thing! >LOL Michele.Tofu is absolutely slimy. Love that background, the blue and gold are just perfect! >Heehee! My kids definitely think that tofu qualifies as “slimy”!Great shot and yes, that does make my mouth water! >LOL! You have such a way with words as well as glass. >I’m a BIG fan of tofu (probably weird to a lot of you) it actually takes on the taste of whatever you put it with, it’s especailly good in breakfast burritos.So…the soup is perfect and yup, it’s slimy;) I like how you kept the entire bowl in the photo, it adds nice symmetery and porpotion. >Tofu, yuck, slimy for sure! Your post is too funny! 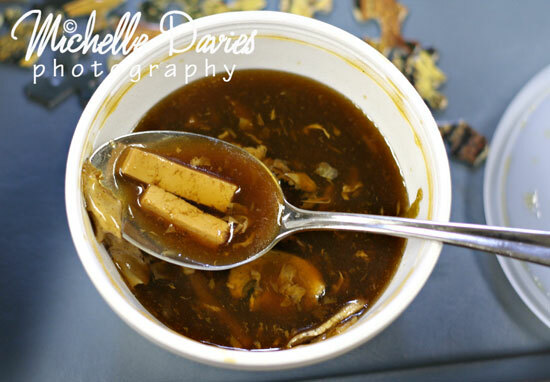 >I love the composition with the tofu in the spoon…although you couldn’t pay me to eat the stuff!! LOL!! >actually looks tasty! love your banner too, way fun! >Very intersting photo. Great angle. >Well, I think you did that on purpose…I LOVE Chinese food and here you go taking a picture of it when I can’t have it…but it won’t be too long now…it’s all about will-power isn’t? Your color is right on. Love the contrasting colors blue/white/brown combination is pretty cool! Focus is good and sharp! TFS! >Great shot.. Glad our theme allowed you to enjoy your lunch!